Christchurch (New Zealand) (AFP) – Women in Christchurch wore makeshift hijabs as a statement of peace and solidarity on Friday, a week after a white supremacist killed 50 Muslims at two mosques in the southern New Zealand city. 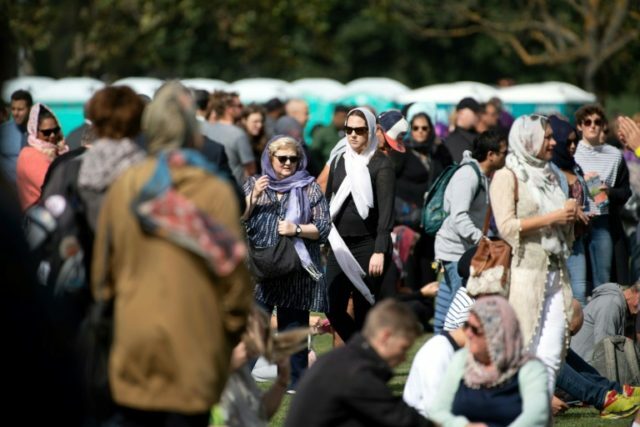 Headscarves are also being worn as a mark of respect by policewomen and non-Muslim volunteers directing the crowds around the site in Christchurch holding communal prayers on Friday. Many are wearing a headscarf for the first time. “There were a lot of confused looks and some slightly aggressive ones,” she said. Women have flooded Twitter, Facebook and other social media — which played a key role in allowing the gunman to spread his message — with their images. “If I could I would be attending the mosque and standing outside to show my support for my Muslim whanau but I’ve got lectures and I can’t really skip them,” she told AFP, using a Maori language term for an extended family.